Meet Mithadeline. Look at this face! Don't you love it? I met her a couple weeks ago when her mom brought her down to see the doctors aboard the USNS Comfort ship. Her mom was hoping they would do surgery on Mithadeline's legs. ﻿Unfortunately, she needs extensive surgery, maybe a series of surgeries. So she was not a canidate for surgery aboard the ship. I made an appointment to come into the the Angel Missions office. She came in last week and brighted up our dark dreary office with her smile. She was a chatterbox and has tons of character! Mithadeline was born with major leg deformities. Her right leg doesn't bend at the knee at all and her R foot is turned inward. Her Left leg is bent at the knee and doesn't straighten at all. She army crawls around her house and scoots using her arms and hands. Her parents carry her back and forth to school everyday. At age 5 they can do this but at age 15 this is not going to be possible. Haiti is not handi-cap accessible to say the least! I have yet to see one sidewalk fit for a wheelchair. There is debris/trash blocking walkways everywhere. Cars park on the sidewalks where ever they want. Even if Mithadeline had a wheelchair, it would be useless in this country. We sent her information to the states and there is an Orthopedic doctor interested in helping her! But the larger issue was how Angel Missions was going to pay for testing and paperwork here in Haiti to get a passport and medical visa. So I started praying and thinking about who could help. I sent out a couple emails to some Christian friends who are active in their church mission committees. Within hours, Teresa Mooney from Kokimo, Indiana, responded. She said her church, Main Street Christian Church in Russiaville, Indiana, was having a mission committee meeting that very evening and she would ask if they would help Mithadeline. Talk about all in God's timing! So I am happy to give a public "Thank You" to Main Street Christian Church in Indiana for sponsorship of a medical visa for Mithadeline! 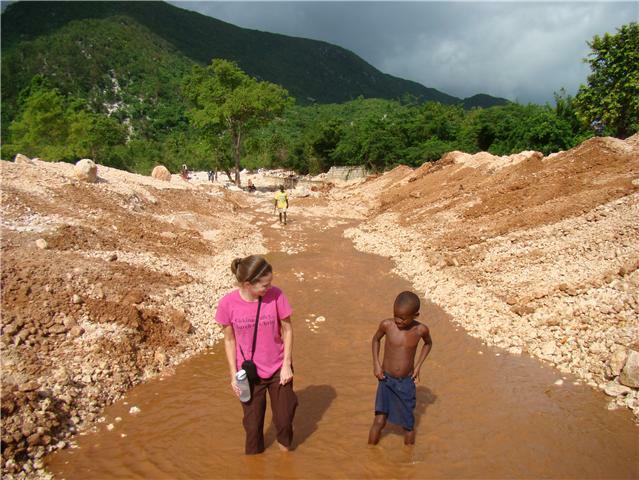 This church is helping change one Haitian child's life. God is putting together the pieces of the puzzle to help this child. I feel blessed to have played my part. And blessed that there are other Christians like Teresa Mooney and Main Street Christian Church willing and ready to play theirs!